Is it really a good idea to install that expensive cappuccino maker when you haven’t fitted a good working boiler or decent flooring? And what about the value added by sprucing up the bathroom (and losing that avocado suite with gold taps)? Will it be worth spending a fortune on expensive fittings or will B&Q do the job? In the complicated world of home improvements, it is every bit as important to know what not to do, as it is what to do, when planning where to focus your energies and spend your budget. Not everything adds value in cash terms, but some ideas could make your house easier to sell. 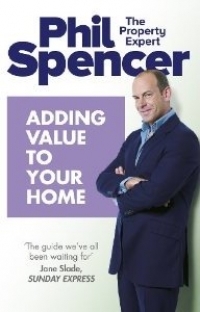 Phil Spencer’s “Adding Value to Your Home” is about both making your property a better place for you to live, and enhancing the value of your principal asset should you decide to sell. In a competitive property market it is crucial to get this right, and no one can help more than property guru Phil Spencer. Showing you how to attract the most attention from buyers and what will make your house sell quicker and for more cash, this book is packed full of practical advice, clear information and real-life case studies. From simple DIY projects or insulating the loft, to coming up with a well-planned and well-executed extension, “Adding Value to Your Home” is here to help you understand what could work best for you, and what will make the overall feel of your house more valuable in the eyes of a potential buyer. The guide we've all been waiting for.